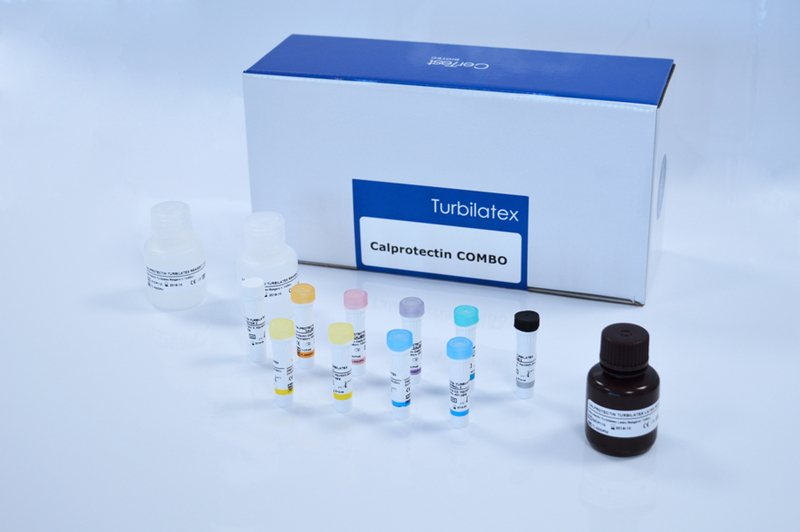 CerTest Calprotectin Turbilatex is a latex turbidimetric assay only for the quantitative detection of Calprotectin in human solid stool samples. This assay is simple, widely applicable and test results are obtained in a very short time. The intended use of the test is exclusively to differentiate IBD patients with inflammation from IBD patients without inflammation and from irritable bowel syndrome (IBS). Calprotectin is a neutrophil cytosolic protein with antimicrobial properties, present at increased concentration in stool samples during bowel inflammation. The resistance of the protein to degradation keeps it stable in faeces for up to 7 days at room temperature, making it an ideal analyte. Calprotectin is released by activation of leukocytes, giving increased levels in plasma, cerebral spinal fluid, urine or stools as a consequence of disease in the relevant organ(s). As it is non-invasive marker of inflammation, determination of calprotectin can be useful in the diagnosis of Ulcerative Colitis (UC) and Crohn’s Disease (CD). Measurement of faecal Calprotectin would represent a surrogate marker of neutrophil influx into the bowel lumen and in turn, act as a marker of intestinal inflammation.